This was my first attempt at bowl turning and it was a bit of a learning curve. I made a few rookie mistakes (starting with a piece of very hard air-dried oak was one!) and the lathe and tools I used weren't well suited to the task, but I'm really pleased with how it turned out. 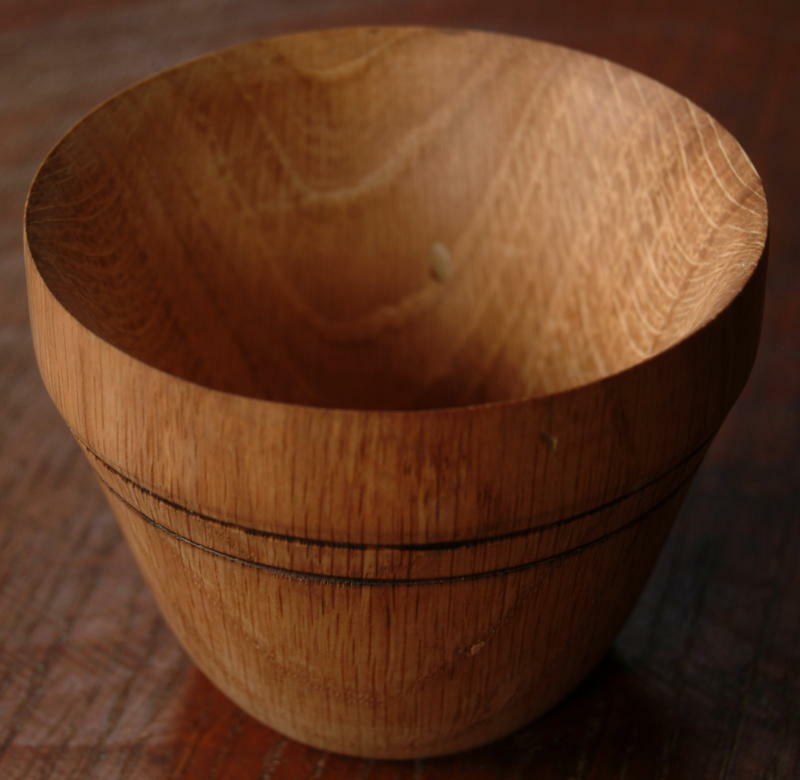 The oak is quite dense and the walls and bottom are quite thick relative to its diameter, giving it a weighty, 'solid' feel in your hand, but the way the rim tapers out to a very thin edge makes it look more delicate than it is. The figuring in the wood is quite beautiful. I suppose it could be used as a drinking bowl (something like a mazer), though I didn't really have any particular purpose in mind when I made it (dad will probably use it to store paper clips and elastic bands and so forth). I finished it by sanding it smooth then simply applying hard beeswax and buffing it with the lathe spinning. The two decorative black lines were made by pressing the blunt corner of a turning tool against the spinning wood until the heat from friction burnt into the wood.